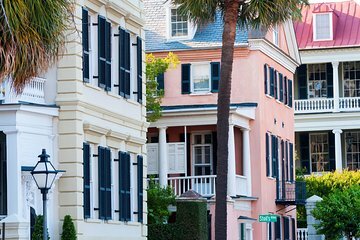 Viaggia indietro nel tempo alla scoperta di una delle città più storiche d'America, Charleston, nella Carolina del Sud, in questo tour guidato di 2 ore con piccoli gruppi. Esplora alcuni dei vicoli più incantevoli della città e passaggi nascosti. Visita l'Old Exchange e il Provost Dungeon, un edificio coloniale con una storia di 300 anni; Rainbow Row, il più lungo gruppo di case a schiera georgiane negli Stati Uniti; più Elliott Street con Poinsett's Tavern; la Heyward-Washington House; Longitude Lane, una delle strade originali della città; il misterioso Stoll's Alley e molti altri. Questo tour guidato e narrativo della storica Charleston, nella Carolina del Sud, ha inizio sul lato nord del Vecchio Scambio e del Provost Dungeon, un edificio coloniale con una storia di 300 anni con pirati, patrioti e presidenti, situato a 122 East Bay Street. Visita spesso i vicoli dimenticati della città e passaggi nascosti che a malapena passano per le strade. Vedi i punti di interesse come Rainbow Row, il più lungo gruppo di case a schiera georgiane negli Stati Uniti. Ammira la Dubose Heyward House e Cabbage (o Catfish) Row, il museo di Heyward-Washington House e molto altro, tra cui un trio di chiese storiche: la chiesa episcopale di San Michele, la chiesa degli ugonotti e la chiesa episcopale di San Filippo. C'è anche il ristorante di McCrady, dove George Washington ha pranzato nel 1791; le case signorili di Stoll's Alley, oltre a Dueler's (o Philadelphia) Alley, Unity Alley e molto altro in questa rilassante passeggiata. Been on a couple of Charleston walking tours and this one was fun and entertaining with information that was shared other tours didn't mention. I felt like there was just too much talking going on and on that didn't really pertain to the tour. It was way too drawn out and I think and hour would be sufficient. But with that said, i also didn't find it very exciting. Bill was a great tour guide, what one would expect from a former AP History teacher. He was excited to tell us all about Charleston and spent extra time with us. My daughters and I had a girls weekend in Charleston and chose this tour as none of us had experienced this one before. Our tour guide was excellent. He knew the history of the city and was enthusiastic about sharing his love of the city. Along the way, he would greet residents and vendors by name and always received a friendly reply. We learned some history we hadn't heard on previous visits. The two hours passed quickly! I highly recommend this tour and our guide! My sister, dad and I did this tour. Bill is an excellent tour guide. He has so much knowledge about the Charleston area. The day we went on the tour it was really pretty chilly, but Bill was so entertaining and kept us all very interested in what he had to say that it didn't even seem like 2 hours in the cold. Well worth the money! Highly recommend if you are considering a walking tour of Charleston! Our guide was very informative and engaging. We learned a lot about Charleston’s history that we would never have known just walking around the city on our own. The group was also small enough so that everyone could see and hear. Great tour! This tour was a great way to learn about Charleston and Bill Stanton was the perfect guide. So many great stories and secret spots. Best value for your money. First time in Charleston and this tour showed you areas you probably wouldn't have know were there. We arrived the day before and walked around the shopping area and had no idea what was behind and between the blocks of King, Meeting and East Bay. Went in July so it was hot. Recommend the 9:30am tour. Tour guide Jim was great! Our guide was amazing and really knew the history behind the alleyways. I would certainly recommend this tour to family and friends that will visit Charleston. One of the best walking tours I've ever been on! You won't find a more knowledgeable or engaging tour guide than Evans Byrd. His tour lets you see Charleston in a whole different light. Evans gives you an insight into Charleston history like I've never experienced before for here or anywhere else. Also if you like admiring the gorgeous foliage of Charleston, Evans is your man. I don't think there is a plant he doesn't know. In the future, I am recommending this tour to everyone as long as Evans is the tour guide. Thanks for a great day in such a wonderful city!